Combine the dry ingredients in a large bowl. Whisk to blend. In a separate bowl, whisk eggs lightly. Add milk, yogurt, and vanilla to eggs and blend. Pour wet mixture into flour mixture. Stir gently until just barely mixed. Pour in melted butter. Stir gently until just mixed. 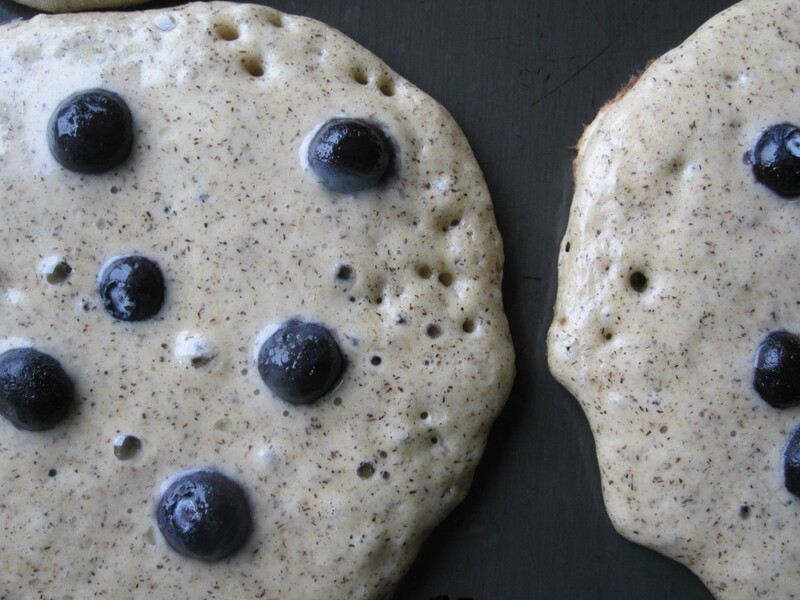 It may still be lumpy, but that is OK. Do not over mix or you will end up with tough pancakes. Heat a griddle on medium until a water droplet skids across the surface. Pour a dime-sized drop of vegetable oil onto the pan. Use a paper towel to spread the oil evenly over the griddle. Ladle batter onto griddle. 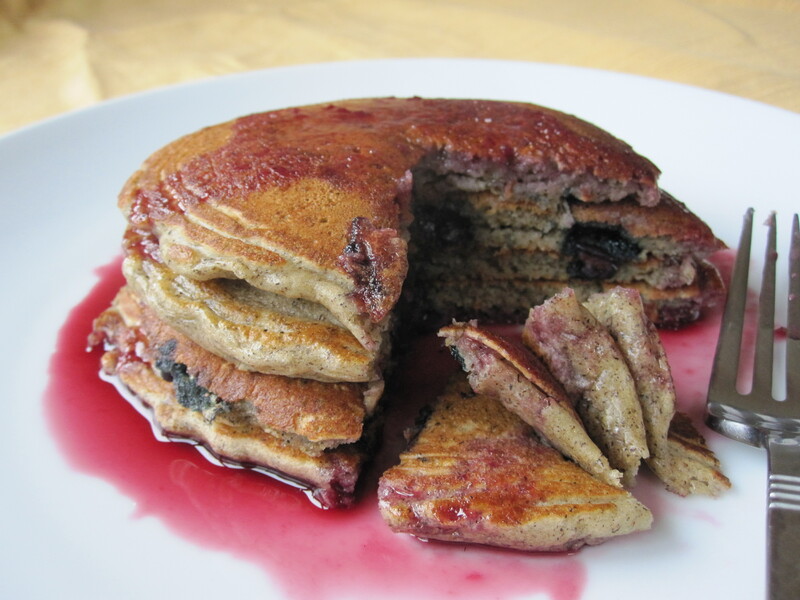 Add berries to each pancake individually (optional, but recommended). Flip pancakes once bottom is nicely browned. Cook until center of pancake is fully cooked. Serve with butter, jam, or syrup. 2012 — Our family couldn’t wait for it to arrive. We wish everyone a happy, healthy year with friends, family, good food, and and lots of time for laughter. Karen, thank you for bringing us all together with your good food! Your pancakes look ooey gooey delicious! I can’t wait to try this recipe. I’ve only recently started working with buckwheat and I love it. I’ve bookmarked these to make soon (as soon as I lose a little of this holiday weight :-))! Oh wise you are, Suzanne! I will have to cut my calories elsewhere. These look scrumptious! Buckwheat pancakes are my favorite, especially with bananas. I’m excited to try your recipe since I’ve bounced around and haven’t found “the one” yet. I like your addition of yogurt, too. Wishing you and your family much happiness in 2012!